Shinzo Abe is using the occasion of the G-8 summit to court leaders across the European continent. Japan is using the occasion of the G-8 summit in Northern Ireland to mount an aggressive charm offensive across the European continent. Although the fruits of this effort are primarily economic, it is taking place in the context of Japan's seeking to hedge against China by expanding diplomatic ties across the world. Conveniently, relations between China and much of the EU have become increasingly strained in recent months. Japanese diplomacy with Europe under Prime Minister Shinzo Abe started in April when Japan and the European Union began negotiations for a Free Trade Agreement (FTA). It continued later that same month when Prime Minister Abe became the first Japanese leader to visit Moscow in over a decade. During the trip, Abe and Russian President Vladimir Putin agreed to work towards a resolution of their sovereignty dispute over the Kuril Islands, as well as expand defense, foreign policy, economic, and cultural ties between the two countries. Then, in May, Japan and France held their Third Foreign Ministers' Strategic Dialogue in Japan. Following closely on the heels of this dialogue, French President François Hollande and his wife spent three days in Japan earlier this month. During their meetings during the visit, Hollande and Abe agreed to expand bilateral cooperation on civilian nuclear matters and defense issues. Notably, Abe sought to use the visit to dissuade the French leader from resuming exports of dual-use technology to China and encouraged France to use its influence in the South Pacific against Beijing. Abe first encouraged France to use its naval fleet in the South Pacific to “punch above its weight” in an op-ed he published immediately after taking office. On his way to the G-8 Summit this weekend, Abe stopped off in Central Europe to hold Japan’s first ever summit with the Visegrad Group, consisting of the Czech Republic, Hungary, Poland and Slovakia (V4). At the summit on Sunday, Abe forcefully made the case that Japan could serve as a nuclear exporter to the Central European countries, an effort that was partially frustrated by Czech Prime Minister Petr Necas’s sudden resignation. After the talks ended, some of the V4 leaders made the case for concluding the Japanese-EU FTA talks quickly. In a Joint Statement the two sides also emphasized their shared commitment to democracy, human rights, and the rule of law, and announced a “Partnership Based on Common Values for the 21st Century” The emphasis on Western political values was undoubtedly intended for policymakers in Moscow and Beijing. This fact did not prevent Abe from meeting with Russian President Putin on Monday after arriving in Northern Ireland for the G-8 Summit. Following up on their April meeting, the two leaders announced they were setting up a new subcabinet-level dialogue to resolve the Kuril Islands dispute and work towards signing a peace treaty officially ending WWII. While failing to agree to a date for those talks to begin, the two leaders said they expected them to be conducted at a “quick-tempo” and announced Russian Foreign Minister Sergei Lavrov will visit Tokyo in the fall. At the meeting, Abe and Putin also discussed North Korea and the expansion of energy cooperation. 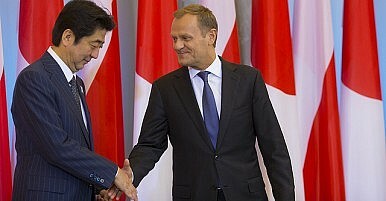 Abe is also expected to meet with British Prime Minister David Cameron on the sidelines of the G-8. Last year, the UK and Japan announced plans to begin jointly developing weapon systems after Cameron traveled to Tokyo to meet with Abe’s predecessor, Yoshihiko Noda. Since then, the UK’s relations with China have cooled considerably after Beijing began snubbing Cameron and his administration over the British leader’s decision to meet with the Tibetan spiritual leader the Dalai Lama. This has mirrored the deterioration in Sino-Japanese relations following Tokyo’s decision to nationalize the disputed Diaoyu/Senkaku Islands last September. In this context, Japan’s Kyodo News reported last week that Japan and the UK would announce a defense intelligence-sharing agreement during the Abe-Cameron G-8 meeting. The two leaders are also expected to discuss the establishment of a high-level bilateral dialogue with the eventual goal of setting up a “two-plus-two” dialogue between their defense and foreign ministers. North Korea, Iran, Syria, and the EU-Japan FTA talks were also expected to be on the meeting’s agenda. Germany proved to be one European country that was immune to Abe’s charm offensive this week. German Chancellor Angela Merkel has been a harsh critic of Abenomics, essentially equating Japan’s quantitative easing monetary policy with currency manipulation at the World Economic Forum in Davos in January. Merkel reportedly continued to trumpet this theme in a bilateral meeting with Abe on Monday, where she also asked Abe to explain how he intended to deal with Japan’s vast debt problem. When she emerged from the multilateral G-8 meeting, Merkel also told reporters that Abe promised the seven other countries he would focus on undertaking structural reforms. This criticism dovetail sharply with that of Italian Prime Minister Enrico Letta, who asked Abe to visit Italy later this year to give a lecture on Abenomics, which Letta said Italy was looking to imitate in an effort to salvage its own declining economic fortunes. The differences in Merkel and Letta’s response to Abe’s charm offensive reflect broader differences between Germany and many of its EU partners, which are increasingly spilling over into Europe’s relations with Asian countries as was on display during Chinese Premier Li Keqiang’s recent visit to Berlin. Japan’s European diplomacy will continue in the weeks and months ahead. The two sides will meet in Tokyo next week to begin the second round of their FTA negotiations. The third round is expected in October and, following Abe’s meeting with European Council President Herman Van Rompuy on Monday, a Japan-EU summit in November. The two sides had initially intended to hold a summit in March but this had to be postponed because of the crisis of Cyprus. The EU is Japan’s third largest trading partner behind China and the United States. Japan is the EU’s seventh largest trading partner and second largest one in Asia behind China. Together they account for one-third of global GDP and 40 percent of world trade. The EU said in a press release on Monday that a FTA would increase its exports to Japan by 32.7 percent, while Japan’s exports to EU countries would rise by 23.5 percent. Japan and the EU will meet again in Belgium in the first week of July to hold the second round of negotiations over their parallel Strategic Partnership Agreement.